The aim of the Committee for Open Debate on the Holocaust is to promote intellectual freedom regarding the "Holocaust" and to offer a forum to those who contest the orthodox Holocaust narrative. 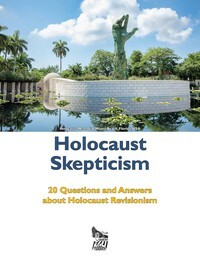 Read our letter-size flyer "The Holocaust Controversy: The Case for Open Debate", our 15-page color brochure Holocaust Skepticism: 20 Questions and Answers about Holocaust Revisionism, watch the below introduction video, or read more about us here. Why do YOU support open debate on the Holocaust? Send your video to [email protected], and we will share it on our channel. A month ago or so we realized that in 2017 Amazon had banned a landmark revisionist book which wasn't even available for sale anymore, and that we had its data right here on our hard drives. Hence, here it is in a revised, second edition! April 16, 2019, 8:21 p.m.
Ernst Zündel talks about the propaganda behind the idea of genocide of the Jewish people. Swiss Revisionist Jürgen Graf tackles this very important subject. April 10, 2019, 3:19 a.m.
April 9, 2019, 10:28 p.m.
April 8, 2019, 9:35 a.m. This video serves as important memorabilia on the historical narrative of the Holocaust revisionists' struggle and to see how questioning the Holocaust has evolved thanks to the Internet. You may want to watch this short talk of two of the greatest revisionists at IHR 1999. Ernst Zündel died in 2017, may he rest in peace, but Germar Rudolf is still a young scientist who is always creating and creative. An inspiration to many. Dec. 26, 2018, 11:13 a.m.
Nov. 30, 2018, 10:58 p.m.
Aug. 26, 2018, 10:06 a.m.
Aug. 3, 2018, 6:34 p.m.
June 25, 2018, 4:16 p.m.